Copyright: ©2016 Thomas H, et al. This is an open-access article distributed under the terms of the Creative Commons Attribution License, which permits unrestricted use, distribution, and reproduction in any medium, provided the original author and source are credited. We report on a 25-year old nulliparous patient requesting nonhormonal intrauterine contraception because of intolerance to oral contraceptives and severe migraine attacks. Ultrasound evaluation revealed a narrow uterine cavity with maximum diameter of 24 mm and a low-grade uterus arcuatus. Following contraceptive counseling, the patient opted for the insertion of a frameless IUD under hysteroscopic view. The case is discussed with special reference to the place of the frameless IUD in women with a narrow uterine cavity. Intrauterine devices (IUD) are long-acting reversible contraceptives (LARC). 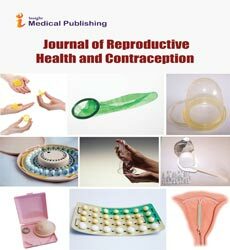 Since they are not dependent on patient intervention, such as with other forms of contraception like oral tablets, patches and vaginal rings, they are associated with the highest efficacy of any contraceptive method and in some reports exceed that seen with surgical procedures. Their convenience and high effectiveness make them the near ideal form of contraception and as such, can have a favorable impact in reducing the overall rates of unintended pregnancies . Women using either copper or hormonal IUDs can expect to experience typical related failure rates of between 0.2-0.8% with hormonal IUDs only being marginally more effective than most copper IUDs. Daily compliance issues are not problematic with IUDs, however it is important that these devices still be well tolerated to achieve long-term use for the full approved effective period. Unfortunately, conventional T-shape IUDs such as Paragard® (Teva Pharmaceuticals, USA) or Mirena® (Bayer Pharma, Germany) are associated with high discontinuation rates prior to the end of their effect lifespans. Discontinuation rates for TCu380A (Paragard) and Mirena are routinely seen over 5 years as being 60% and 50% respectively, with some studies reporting even higher rates. On average approximately 10% of IUD users discontinue their use annually for reasons other than a desire to conceive. Discontinuation of copper or levonorgestrel (LNG)-releasing IUDs for systemic side-effects are rare. Utilization of low doses and their ability to work regionally minimizes systemic exposure and systemic sideeffects. Many women request removal of their IUD, most often due to side effects such as cramping pain and unscheduled bleeding or heavy periods with a significant number occurring early after insertion . Optimizing the relationship between the IUD and the uterine cavity will likely eliminate or attenuate these untoward side effects and prolong the continuation rates in many women. Unfortunately basic design features for T-shape devices afford little opportunity for enhanced tolerance. Jaydess/Skyla is a smaller lower dose LNG device; however it still possesses many of the same design features as Mirena. Jaydess/Skyla was introduced as a 3 year device targeted as being more suitable to nulliparous women because of its lower dose and smaller size. It has a transverse arm of 28 mm while that of Mirena is 32 mm (identical to that seen for TCu380A) but its 3 year discontinuation is approximately 70 to 75% quite similar to the 3 year value seen with Mirena. In contrast, discontinuation rates with frameless IUDs such as GyneFix which lack the transverse arm and is much smaller than conventional T-shape devices, are less than 10% in 5-year studies [2,3]. The body tolerates medical devices/accessories that fit the body perfectly with minimal irritation and discomfort whether it is a dental impact, an artificial hip or even a pair of designer shoes. The ability of the woman’s uterine cavity to accommodate an IUD is paramount to her achieving longlasting use. This aspect of IUD use is often overlooked by healthcare providers because of the perceived notion that no alternative systems exist to the current devices available. Furthermore, the ever increasing use and availability of office and clinic based sonography systems afford the physician an opportunity to assess the uterine cavity of the patient prior to and after IUD insertion in order to assure optimal fit and placement. Researchers found that pain during use of an IUD is related to the disparity between the size of the uterine cavity and that of the IUD. Particularly a device too wide for the uterine cavity was found to be cumbersome to the patient. Development and eventual commercialization of IUDs that take into account patient’s individual uterine cavity size with respect to uterine fit has not been easily achieved. This article will discuss the geometric aspects as it relates to IUD tolerance and continuation of use. GyneFix® (for conventional insertion) or ReLARC® for hysteroscopic insertion (Contrel Europe, Ghent, Belgium) is an innovative concept in intrauterine device (IUD) technology. Unlike conventional T-shape devices which rely on size and geometric shape to be retained within the cavity, GyneFix/ ReLARC utilizes a small anchoring mechanism for retention, fixed directly to the uterine fundus. Once properly affixed the device has been shown to be retained for over 12 years with minimal secondary expulsion. Its novel anchoring system allows for the elimination of the transverse arms enabling for much smaller devices to be utilized. This innovative device has no plastic body, thus referred to as frameless design, and due to its segmented design, is completely flexible in all directions when inserted. Its small size and flexible nature afford it the ability to react to changes in the uterine cavity, unlike conventional T-shape devices, all but eliminating the impact of uterine forces attempting to expel, it especially during menstruation. GyneFix and ReLARC consist of 4, 5 or 6 copper tubes, each 5 mm long and 2.2 mm in diameter, threaded on a length of nonabsorbable polypropylene suture material. The tubes are prevented from sliding off the suture by means of crimping the upper and lower sleeves, with the remaining cylinders being free moving along the thread. The proximal end of the thread is provided with a preformed knot which at the time of insertion is fixed to the fundal myometrium by means of a specific inserter. Immediately below the anchoring knot is a small stainless steel tube (2 mm long and 0.5 mm in diameter) which is fixed onto the suture thread. This metal element (marker) allows clear visualization on ultrasound examination to assure proper placement. Unlike conventional copper wire based IUDs, the use of copper cylinders allows for copper release from all internal and external surfaces. Thus smaller devices can achieve comparable and higher copper release to those seen with higher-load copper IUDs, The total surface area of copper, including the inner and outer surfaces, is 250 mm2, 300 mm2 and 380 mm2 for the 4 tube, 5 tube and 6 copper tube devices, respectively. The device is preloaded in a specially designed sterile inserter for either conventional or hysteroscopic insertion. After making contact with the uppermost fundal wall, the anchor is pushed into the myometrium of the uterine fundus with the inserter over a controlled depth of 9 mm. Specific inserter modifications are required to allow for conventional, or for hysteroscopic insertion. Insertion is as simple and straightforward similar to inserting a uterine sound. It is a minimally invasive technique; however, familiarity and dexterity is still required. Insertion of the conventional technique can be viewed on http://www.wildemeersch.com. A video of the hysteroscopic insertion procedure can be obtained from the authors. Recently, the procedure and inserter where modified to allow for direct visual insertion by means of the use of a hysteroscope. Given the narrow width of the device, it is the only marketed IUD capable of fitting through the working channel of a hysteroscope. This procedure affords direct inspection of the uterine cavity prior to insertion and allows the physician full view of IUD placement. Modification to the inserter is required to allow for use in tandem with various hysteroscopes; however features associated with placement and placement depth are identical to that seen with conventional insertion. A 25-year old nulliparous woman consulted with complaints of intolerance to oral contraceptives and severe migraine attacks over the past months and requested the insertion of an intrauterine contraceptive device. A pre-insertion 2D ultrasound examination revealed a narrow uterine cavity which measured only 24.2 mm in width (Figure 1). She was previously advised by her gynecologist to use a non-hormonal IUD because of her migraine condition. As her uterus was very narrow, in contrast to the size of TCu380A IUD, a frameless copper IUD was proposed. She agreed with this option as the device is small and flexible but although not required preferred insertion under intravenous sedation and analgesia (Total Intravenous Anesthesia or TIVA) because of difficulties she experienced with other gynecological procedures. Figure 1: 2D ultrasound of uterus (transverse view) with cavity width of 24.2 mm. Hysteroscopy examination revealed a narrow, but normal uterine cavity with low grade uterus arcuatus (Figure 2). 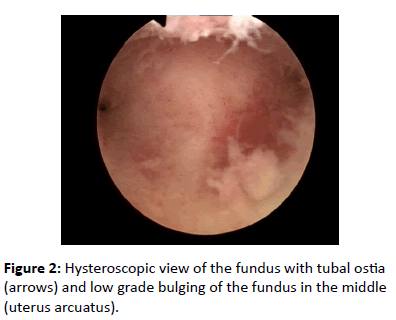 Figure 2:Hysteroscopic view of the fundus with tubal ostia (arrows) and low grade bulging of the fundus in the middle (uterus arcuatus). The frameless IUD was anchored in the midline (Figures 3A and 3B) with no difficulties. Figure 3:A) Hysteroscopic view of the frameless IUD anchored in the midline of the fundus; B) View from the cervix. Note the narrow cavity in the fundus precluding the suitability of a conventional IUD. Following insertion, the exact position of the anchor is checked (Figure 4). Figure 4:2D ultrasound following insertion of the IUD. 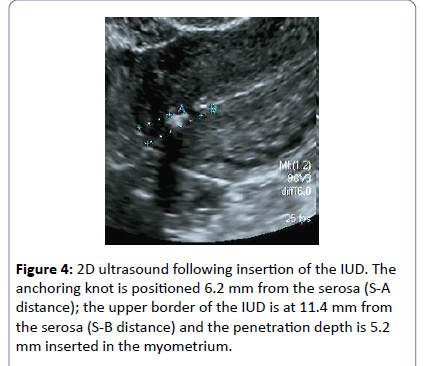 The anchoring knot is positioned 6.2 mm from the serosa (S-A distance); the upper border of the IUD is at 11.4 mm from the serosa (S-B distance) and the penetration depth is 5.2 mm inserted in the myometrium. Recent studies using 2D and 3D ultrasonography have found that uterine cavities come in varied shapes and sizes in contrast to that depicted in most medical texts. Table 1 shows the result of measurements of the fundal transverse width in over 400 nulliparous women (Contrel Research, unpublished data). A mean width of approximately 22 mm with a range between 6 mm and 40 mm was found. Very narrow uterine cavities of less than 22 mm were found in 50% of women (Table1). Table 1: Uterine fundus transverse diameter measured in 408 nulliparous women. Conventional T-shape or framed devices have an overall diameter of 32 mm while frameless systems are much smaller being <3 mm in width. An IUD that fits properly and produces minimal disruption to the uterine cavity environment will significantly contribute to current efforts to increase use of IUDs for pregnancy prevention and to reduce the number of unintended pregnancies, particularly in young nulliparous and adolescent women, as this will enhance tolerance and continuation of use. Conversely, an IUD that does not fit properly will cause cramping, pain, result in embedment or possible perforation and may enhance menorrhagia dysmenorrhea episodes in these women. If uterine contractions, either during or in absence of menstruation are severe they can compress, distort, displace, embed, or expel the IUD, particularly if the IUD is too large and is not capable of adaptive changes (Figure 5) [4,5]. This will ultimately often result in early discontinuation. Moreover, displaced or malpositioned IUDs in the lower uterine segment or the cervix have led to accidental pregnancy  (Figure 5). Figure 5:A) 3D ultrasound of gross disparity between a Tshaped IUD and the uterine cavity with both transverse arms embedded in the uterine wall; B) Hysteroscopic view of a T-shaped IUD with both transverse arm embedded in the wall of the uterus. The patient in this case report was fitted with a frameless IUD since her uterine cavity was narrow. She by no means is atypically with ~50% of the women having maximal uterine cavity widths 1 full cm smaller than the size of the leading IUDs. In fact, approximately 29 women in our study had uterine widths below 15 mm. Only 10 women had maximal uterine widths of >32 mm, the width of TCu380A or Mirena. A frameless system is the solution for many young women given the size limitations of their uterine cavity. Both conventional and hysteroscopic procedures can be used for the insertion of frameless devices. The hysteroscopic technique allows for direct visualization of the uterine cavity and device insertion prior to and during the procedure. At follow-up, for either conventional or hysteroscopic insertion, the correct position can be checked by locating the anchoring knot in the fundus of the uterus. Displacement of the anchor post-insertion from its original position is very rare and therefore yearly checks of the position of the IUD are optional and only necessary as part of a routine gynecological examination . Women pay over $1000 for an IUD, which includes insertion, in the US. In Europe, the cost for the woman can reach €400-500. In many European countries, IUDs are not reimbursed or only partly reimbursed. A large percentage of user discontinue the method because of side effect and expulsion prior to the end of their effective lifespan. Experts confirm that the most common side effect of IUD use, abnormal bleeding and pain, are predominantly caused by IUD-uterine cavity incompatibility. Healthcare providers should be aware of a patient’s uterine cavity size and therefore measure the width of the cavity prior to selecting a framed IUD in an attempt to maximize patient comfort and continuation of use. In contrast, measuring the width of the cavity is obviously unnecessary with a frameless IUD since they fit cavities of every size, even those as small as 6 mm. Frameless deigns may be a far better choice, especially for younger women, particularly if the transverse dimension of the uterine cavity is not available . Thomas Hasskamp: nil. Dirk Wildemeersch, MD, PhD, has been involved in the optimization of new, innovative; drug delivery systems for use in the uterus. He is currently advisor in devising new concepts in controlled release for contraception, gynecological treatment, and prevention of infectious diseases. (2012) Committee opinion no. 539: Adolescents and long-acting reversible contraception: implants and intrauterine devices. ObstetGynecol 120: 983-988. Wildemeersch D, Jandi S, Pett A, Nolte K, Hasskamp T (2014) Use of frameless intrauterine devices and systems in young nulliparous and adolescent women: results of a multicenter study. Int J Womens Health 6: 727-734. Cao X, Zhang W, Zhao X (2006) Three-year efficacy and acceptability of the GyneFix 200 intrauterine device. Contraception 73: 315-317. Benacerraf BR, Shipp TD, Lyons JG, Bromley B (2010) Width of the normal uterine cavity in premenopausal women and effect of parity. ObstetGynecol 116: 305-310. Shipp TD, Bromley B, Benacerraf BR (2010) The width of the uterine cavity is narrower in patients with an embedded intrauterine device (IUD) compared to a normally positioned IUD. J Ultrasound Med 29: 1453-1456. Inal MM, ErtopÃÂ§u K, Ozelmas I (2005) The evaluation of 318 intrauterine pregnancy cases with an intrauterine device. Eur J ContraceptReprod Health Care 10: 266-271. Wildemeersch D, Pett A, Jandi S, Nolte K, Albrecht W (2014) The anchor of the frameless intrauterine device does not migrate over time: an analysis in over 300 women. J Contraception 5: 91-96. Wildemeersch D, Goldstuck ND, Hasskamp T (2016) Intrauterine systems: a frameless future? Expert Opin Drug Deliv 13:911-918.